During the raids of WW2 a gunner issued complaints against our methods of defence, it was said, that shooting down an aircraft at night was ��like shooting a fly in a darkened room with a pea shooter''. The Marconi Osram Valve Company amongst others, were given the task of solving the problem. Guided Missile technology was not an option at this time (the Germans astounded the world, later in the war with their V1 & V2). It was decided that a shell fuze, which triggered when an object was in the proximity of the shell (such as an aircraft), was the solution. The biggest problem was how to protect the amplifier section of the fuze from the blast of the gun. Special valves were developed to solve the problem; these can be seen in the 2nd section of the display. On leaving the gun at 20,000g and spinning at 3,000 rpm together with the vibration of the barrel, the success of these fuzes was no mean feat. Tests fired the fuze 8 miles into the sky vertically. On returning to the ground it had to be dug from under 8 feet of Salisbury Plain, amazingly it was still working. 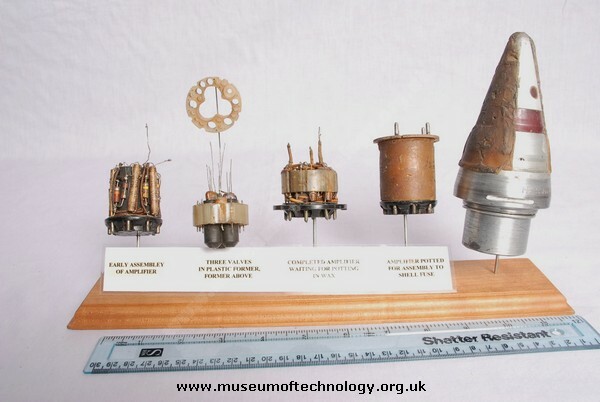 The amplifier is in the base, this was connected to the battery which was made of ring shaped plates around an ampoule of acid, upon firing of the gun the ampoule shattered and soaked the plates turning them into a charged battery. The top is a pointed cone and a plate embedded in plastic, this formed a capacitor which oscillated at 100mghz, if an object came close to this (up to 30ft) the oscillation was disturbed and the final valve triggered the detonator. The valves are oscillator, amplifier and trigger valve. Although the final product was produced and tested (over the channel so if it failed to explode it could not fall in to enemy hands), it needed to be produced in vast numbers; our manufacturing capability was saturated with weapons and planes at the time so the project was passed to the Americans. At the same time Radar was now becoming a reality and this unit was scrapped in favour of a device that used the new technology. Many of these and the new version were instrumental in bringing down the V1 ''Doodlebugs'' during the war. These fuzes were also called "Variable Time" fuzes. The reason behind this was security, in order to disguise their true nature from the Axis. This designation has lasted to the current day amongst the artillery who still sometimes refer to proximity fuzes as "VT".